The knee is the most complex joint in the body and is formed by the articulation between the thighbone (femur) and the shinbone (tibia). A kneecap is present over the front of the joint to provide extra protection. These bones are held together by four strong rope like structures called ligaments. Two collateral ligaments are present on either side of the knee and control the sideway movements of the knee. The other two ligaments are the anterior and posterior cruciate ligaments, ACL and PCL respectively, which are present in the center of the knee joint and cross each other to form an "X". The cruciate ligaments control the back and forth movement of the knee. Knee ligament injuries are common in athletes involved in contact sports such as soccer, football and basketball. Knee ligament injuries are graded based on the severity of injury. In grade II there is a partial tear of the ligament. In grade III there is a complete tear of the ligament and the ligament is divided into two halves making the knee joint unstable. 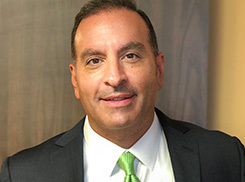 The surgical repair of the completely torn ligament involves reconstruction of the torn ligament using a tissue graft taken from another part of the body or from a donor. The damaged ligament is replaced by the graft and fixed to the femur and tibia using metallic screws. Gradually, over a period of a few months, the graft heals. Arthroscopic reconstruction of the knee ligament is a minimally invasive surgery performed through a few tiny incisions. 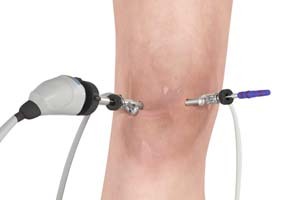 An arthroscope is inserted into the knee joint through one of the small incisions to provide clear images of the surgical area (inside the knee) to the surgeon on a television monitor. Guided by these images the surgeon performs the surgery using small surgical instruments inserted through the other small incisions around the knee.